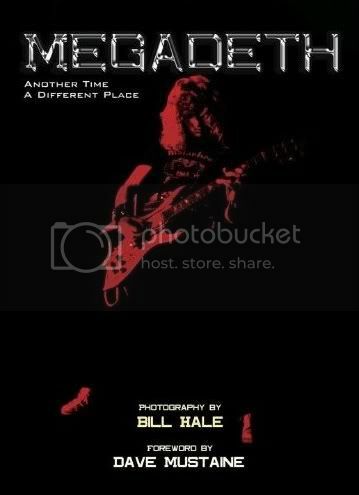 On March 13th, MTV Press and author Bill Hale is releasing a new book called MEGADETH: Another Time, A Different Place which gives the audience a front-row seat into the early days and meteoric rise of this young band who would become one of the most influential groups of all time and, with ANTHRAX, SLAYER and METALLICA, consistently touted among the best “thrash metal” bands ever to cross the stage. This is the first Megadeth photography book and only the second book documenting their rise to rock glory, including rare, never-before-seen photographs representing a small but crucial period of time in their career. Hale’s photographs, from intimate backstage photographs to screaming, kinetic live shots, are the images of a young band prepared to take on the world. Megadeth leader Dave Mustaine writes in the Foreword: “The ‘work’ that you hold in your hands now is the work of a friend, who is also a ‘photo-grrrrrrr-apher,’ and who has captured the very essence of my career: hungry, gritty, hard, cold, impersonal, personal, and very personal. Also, the sensitive unseen side of me, which was somewhat of an anomaly with the public and left me an enigma to my peers."